Shin splints usually happen in the lower half of your shin (also called the tibia). They mostly occur right above your ankle, to halfway up your shin, but you can also get a shin splint in about any part of your lower leg. Because shin splints are not a superficial problem, the causes are often to be found in the biomechanics of your legs. At The Foot Clinic Perth (Cottesloe), we have built a particular expertise in the biomechanics of the body, and our biomechanical assessment is one of the tools we use to define the exact cause of your shin splint. Shin splints can be caused by overused muscles. The muscles in your lower leg can get overworked because of physical activity. For example, if you are a running, and you change the average distance of your run, or change the surface you run on. Some shin splints are more linked to a problem with a muscle, while other shin splints are caused by a problem with the bone. If the pronation of your feet (rolling inwards to absorb shocks) is not ideal, then this may cause overuse of other areas of your leg. Additional causes of shin splints are a lack of flexion in your knee, or a lack of core stability (linked to your lower back). Knee pain can be brought on by numerous things: flat feet, foot pronation, Osgood Schlatter’s Disease and many more. Postural and balance strengthening is the key to maintaining a strong, resilient body. And it starts with your feet. Your first step would be to rest your leg, and to apply ice while using a pain killer to reduce the acute pain. It is recommended to see your podiatrist at The Foot Clinic as soon as possible, to determine the exact cause of your shin splint. Depending on your situation and the exact cause, our team of experienced podiatrists will look at the biomechanics of your body: the connection between your feet, knees, legs and hips as you move. This will help clarify which bones or muscles may have been overused. Then, your personalised treatment plan will focus on reducing the pain, and on improving your biomechanics. In simple words, working on stretches and posture, looking at footwear or orthotics, and giving you simple exercises to return to normal as soon as possible. Shin splints, like many other podiatry needs, can affect your freedom and your ability to live your live at the fullest. That’s why, at The Foot Clinic, we are committed to helping you with mechanical conditions, soft tissue injuries or sporting injuries. So you can get back on your feet. As a team of friendly and experienced podiatrists, we are committed to providing you with an outstanding podiatry service. And we also keep improving our levels of service, through further education, and implementing the latest technology. 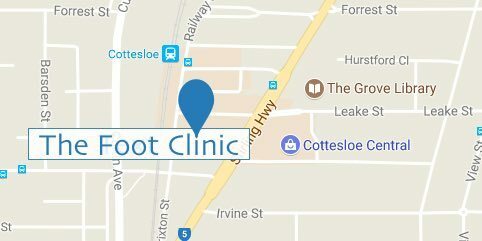 Contact The Foot Clinic, at Cottesloe Central in Cottesloe, so we can take care of your shin splints today.